Hello readers! First, I want to thank you for your continued support and readership. Second, I wanted to let you know that while I am not currently updating this blog, I am still here and am always happy to take emails, questions and comments. It has been brought to my attention that my printables are no longer accessible, and I am working to fix that problem. In the mean time, if there are any printables that you are in need of, please email me so I can send them directly to you. Also, I am still sending my 365 Things We Love About You list out on a daily basis, so please email if you would like a copy of that, too. I know Father's Day is coming quickly, and I usually try to reply to emails within a day or two of receiving them. Thank you again! 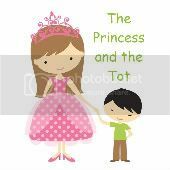 I hope you continue to enjoy browsing The Princess and the Tot! I was recently at Dollar Tree and happened to look through the school/office section. I didn't expect to find anything exciting mid-year, but I found these adorable classroom decorations and immediately knew what I wanted to use them for. Super Tot and I are working a lot on learning the alphabet right now, so I thought doing an uppercase/lowercase letter match with them would be perfect. I didn't want 26 (x2) pieces spread out all over, so I decided to make them attach to each other when he matches them. Here is a simple tutorial for what I did. I present these to Super Tot in two bowls - one with the worms and one with the apples. He lays out all the apples (uppercase) and places the correct worm (lowercase) in each one. I also purchased a second set with frogs and lily pads, which I intend to use for something similar. Additionally, I have enough of the apples and worms left to do numbers 1-10, which I am excited about, too! Five or six years ago, my family began the tradition of making a special batch ornaments to give out to various people we come into contact with throughout the Advent season. We give them to sales people, delivery drivers, store clerks, postal employees, waiters, etc. We also drive around throughout the season to look at Christmas lights. Each night, we vote on a few favorite houses and knock on those doors to deliver our ornaments as prizes to those families. No matter how God chooses to have our paths cross, the recipients are always blessed and truly grateful. In addition to thank you, we often get smiles, tears and hugs. The biggest blessing to us, however, is bringing joy and spreading God's love to others. For several years, we have made Christmas Nails (tutorial here). This year, however, we wanted to do something different. I was looking through my craft supplies and found some wooden peg dolls and eggs. I purchased these to make a set of dolls as a gift, but didn't end up making them. I decided to try making nativity ornaments with them. I am so excited about how they turned out!! I only had enough supplies today to make 4 of them, but I ordered more and can't wait to get them all made!! I will be posting a tutorial once those supplies come in. I will mention that these were EASY! It only took me about 10 minutes to make the first 4, including allowing the paint to dry. I can't lie, my family is very excited about Christmas. We love the excitement of the season, and can't wait to begin our Advent activities. That being said, we want to be sure not to skip over Thanksgiving. We are so incredibly blessed, and want to dedicate the next few weeks to truly focusing on those blessings and being thankful to God for His provision. We decided to make a "Thankful Tree" to help us concentrate on the many things we are, indeed, thankful for. Our tree is about 4 feet tall and is a focal point in our living room. I used brown gift wrap/packing paper for the trunk and cut the leaves out of construction paper. The leaves aren't pretty, but the thoughts on them are absolutely beautiful! Every day between now and Thanksgiving, the four of us will each write something we are thankful for onto a leaf and attach it to our tree. By Thanksgiving, there will be 88 things to thank God for on our Thankful Tree!! Tip: Japanese Washi tape comes right off the wall leaving no marks and causing no damage. This week's preschool workboxes focus on a dinosaur theme. I hope you enjoy them! Clip the matching clothespins onto each dinosaur to make his legs. I used mini paper plates and ink pads for this quick project. You can also use more clothespins and have your child make spikes on the dinosaur's back. Place the correct number of dinosaur stickers onto each sheet of construction paper. Sort the dinosaurs by type. This will be a simple game of hide and seek that we will probably play over and over. I made the toilet paper roll dinosaurs from printouts here. The egg is a ping pong ball. Match each dinosaur to the correct egg (upper & lower case matching). Printable available here. Side Note: I love The Mailbox Magazine! They had an incredible sale recently, so I stocked up on some of their books and theme kits. The next 4 activities are from one of the theme kits I purchased (available here). The kits come pre-laminated, which is wonderful! This game is from The Mailbox Magazine Mix & Match Games Book, available here.